A collection of photos showing the Brice A fuel channel liner latch. Darlington: fuel bundle support on the inlet end at start of life at Darlington. As the pressure tube elongates due to induced creep and growth, the force of the coolant flow pushes the fuel string towards the outlet, and the inlet fuel bundle slides to the right. 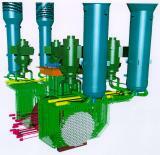 Steam Generator for 600 MW(e) N.P.S. Temperature vs. distance through the steam generator. Simplified flow diagram of a PHT purification loop. Estate of Gregg Hayter. Donald (Gregg) MacGregor Hayter, d. June 7, 2014. Nuclear Engineer, first with AECL, then with Ontario Hydro, retired 1993. Miscellaneous NPD Fueling Machine Drawings - overall system and components. 48 drawings in all, circa 1960. This NPD 7 element riveted bundle is in its classic autoclave black. This end plate on the NPD 7 is now assembled by TIG welding to a thinner end plate. In some colour photos the rusty colour on the surface of fuel bundles is from endurance testing in the lab and comes from the iron oxide from the carbon steel piping, even though the bundles rested in a Zircaloy pressure tube. The end view of a NPD 19 element assembled by TIG welding. The 19 elements are spaced by two wires wrapped around each elements and spot welded to the sheaths, one turn per length of element. The Douglas point 19 element bundles were wire wrapped but the helix around the element was doubled. Thicker wires were attached at each end to act as bearing pads so the bundles could slide through the pressure tubes with minimum wear to the tubes. 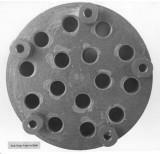 An example of the DP 19 element bundle covered in the iron oxide and showing the extra wire pads which are partially ground to a flat surface contoured to fit the pressure tube. A comparison of the NPD & DP 19 element bundles. Note that the DP bundle now assembled by resistance welded of end plates to the elements. Another design using brazing of the ferrule spacers to the elements were tried. Again did not graduate. But Zr-Be brazing was introduced. The end view of the above bundle with fixed brazed spacers and domed end caps. The end view of the same bundle. The chamfer on the end caps was to accommodate the chamfer on the side stops. After a number of defects during irradiation in NRU the design was abandoned and end plates were reintroduced. This bundle had no spacing and was not irradiate. This an end view of the Tube-in-Shell bundle. The traces of the braze alloy are evident around the tube ends. The design has now matured and the spilt-spacers are now canted to prevent interlocking and a full length bearing pad has been added in the center plane. This bundle has seen endurance testing in the Sheridan Park loop and the braze alloy has a higher corrosion rate than the normal Zircaloy, thus the white appearance at the joints of the bearing pads. This is a Westinghouse made bundle after they took over from AMF. Note the grounding electrode marks on the end caps from resistance welding of the end plate to the elements. These end views are of two CGE development bundles where the use of welded bearing pads and spacers were tried. Also a variant of the end plate in two pieces. Note that the inner element caps are flat. This design did not go into production. The end plate for the 28 element Pickering bundle took many forms which are illustrated in the following photos. A close up of the two piece end plate on the welded 28 element development bundle. CGE still trying to develop the welded 28 element bundle, now with welded straight pads and more than one plane of inter-element spacers. Single piece end plate. 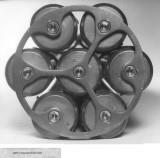 Westinghouse came up with the final production design of the Pickering 28 element bundle. It had brazed spacers and bearing pads and a classical simple end plate design proposed by an accountant. 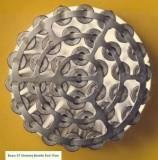 GE was now using brazed pads and spacers and again a different end plate design. 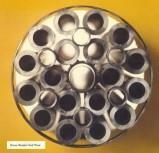 CGE traded wire wrap technology with Westinghouse for brazed technology. B&W of Gentilly -1 Boiling Light Water 18 element fuel bundle. nitially it was thought that the 28 element bundle would meet Bruce requirements but when the design of the reactor was uprated, it was necessary to develope the Bruce 37 element, to meet the channel power requirements. Note the staggered plane of bearing pads at end of the bundle to meet Bruce Channel requirements. The Bruce 37 element had minor differences from the other 37 elements that were developed. The end caps were squared and the bearing pads were staggered at each end of the bundle. The end view of the Bruce 37 element bundle. Note the grounding electrode marks of the resistance welder. This photo gives a perspective of the size of the Bruce 37 element bundle relative to the man’s gloved hands. The bundles weighed approx 50 lbs and were 49.5 cm long and 10 cm in diameter. The comparative sizes of a Bruce Booster bundle and the 37 element bundle. This drawing of the Bruce Booster Rod Assembly demonstrates how it is assembled into a complete rod of six bundles. 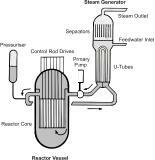 A comparison of the Bruce booster bundle with the power reactor fuel bundles for Pickering A & B, Bruce A& B 37 element and the Gentilly-2 600 MWe reactors. The 25 ton flask is used to remove irradiated fuel strings from the U-2 and U-1 loop test sections in the NRU research reactor at Chalk River. 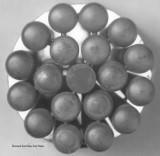 The Universal Hot Cells were used to examine irradiated fuel bundles and to disassemble the strings of fuel. The fuel bundles were examined and measured for dimensional changes and individual elements were cut out of the bundles for more detailed examinations. A 19 element fuel bundle being remotely moved by special tongs in the hot cells. 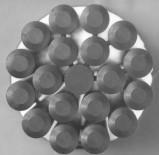 This bundle had been irradiated to over 8,500 Mwd/tonne U at a heat rating of 43 W/cm. Note the circumferential ridges at the UO2 pellet interfaces. To disassemble a fuel bundle in the hot cells remotely, the end plates were cut apart by a milling machine. For fuel bundle testing in the verticle loops at NRU, six fuel bundles were assembled via a fuel carriage tensioned at one end with a spring, sometimes called a ‘birdcage’. The six bundle assembly was essentially 1/2 of a CANDU fuel channel. 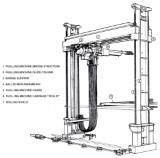 Each type of bundle was strength tested in a compression test rig at temperature before and after irradiation. 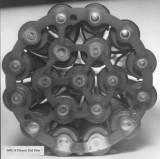 Irradiated bundles were some times stronger than the limit of the machine capabilities. These test was necessary to ensure that the bundles could withstand the fueling machine and hydraulic loads. Generic diagram of what the central role that fuel played and what teams had to coordinate to get the various fuel programmes designed and into production. Specific diagram of what the central role that fuel played and what teams had to coordinate to get the various fuel programmes designed and into production. Steam and feedwater system for a CANDU reactor. 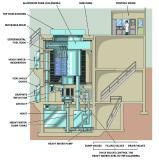 Three element steam generator level control system (courtesy of NB Power). 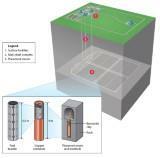 Steam generator level alarms and set points (courtesy of NB Power).